Those are the words of Lindsay Shedden, who took over as festival director following the departure of Sled Island’s creator. Originally the brainchild of Zak Pashak, the festival was a concept that Pashak felt could bring the community closer together and stop people from uttering those six words we’ve all heard so many times: “There’s nothing to do in Calgary.” The music and arts community in Calgary had been blossoming for so long it seemed that fruition needed a catalyst of some kind. Pashak, who ran for alderman of Ward 8 in Calgary’s civic election last fall, knew that Calgary was a city worth sticking with. Instead of moving to another major arts centre in Canada, such as Vancouver, he went ahead and proved our city’s potential to everyone else. Photo by Kelsey Hipkin. 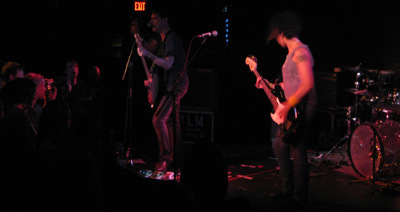 The Thermals perform last year at one of the Sled Island festival's many righteous venues. This year sees a new director and The Reflector took a moment to have a chat with Shedden. She says that the transition between she and Pashak has been quite seamless and Pashak’s role will really only change slightly, he will continue to book the bands as he has done in past years but he’s also joined the board of directors. Some venues have been dropped and some picked up this year, and a few sponsors, such as ACAD, have thrown their hats into the ring. The new venues won’t be revealed until the official schedule is announced in May, but Shedden says there are some things a goer can always look forward to. Every year the festival has guest curators to give their input, contribute their expertise and lend a hand during the festivities. This year will see four lucky candidates fill the roles: three musicians and one CBC Radio 3 personality. “The guest curators this year are Ian Svenonius, Grant Lawrence, and (the band) Bogus Tokus,” says Shedden. “Ian Svenonius is known as the singer and mouthpiece of multiple Washington, D.C.-based music groups including Nation of Ulysses, The Make-Up, Weird War, and Chain and The Gang. He is also a published author and an online talk show host and is characterised by his various antics and theatrics, at least some of which we hope to see. “Grant Lawrence, a veteran Canadian radio personality and host of CBC Radio 3, and is passionate about the Canadian indie music scene. He has invaluable input into this year’s run. Though it may seem like major bands’ touring schedules often overlook our wee Cowtown, Shedden says that they are having little trouble getting the names they go after. The newly appointed director, who is also new to the city, says she’s thrilled to be living in Calgary and looks forward to being part of the vibrant community.